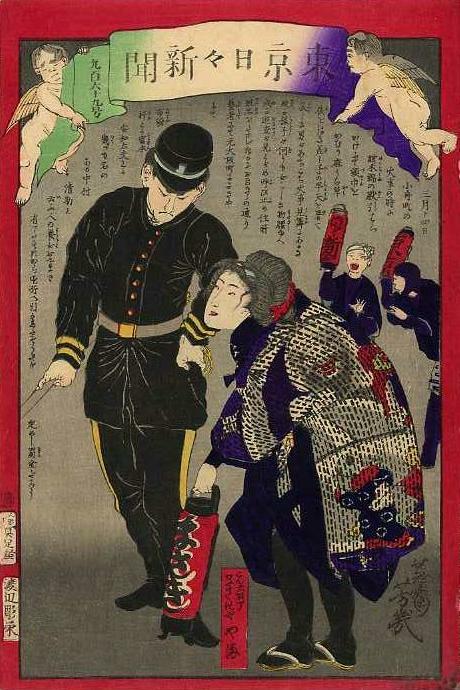 A geisha who liked to dress as a fireman is hauled in by police for questioning. The red lantern held by the geisha reads "Masaki", the name of one of several businesses owned by the man who had adopted her. The red cartouche by the lantern identifies the geisha as "Yama [of] Masakiya in Moto-Ōsakachō" (元大坂丁まさきや / やま). In 1878, Moto-Ōsakachō became part of Nihonbashi-ku, which became part of Chūō-ku from 1947. The neighborhood is in the larger Ningyōchō area of Nihonbashi today. The speculation that the woman was fined alludes to provisions in an 1872 Tokyo ordinance concerning behavior regarded as contrary to public and social order. For details, see Tokyo Ishiki kaii jorei of 1872 in the Law section of the Society feature on the Yosha Research website.